Farming may be both - boring agony or satisfying leisure time, everything depends on you. Trying to maintain fun while farming you should renew your whole farming assortment. Trying to carry whole farm on your bare hands, farming can become too much for one person to handle but if you invoke modern technologies every part of farmer’s job becomes way easier and satisfying. 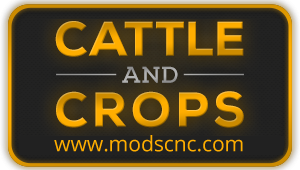 Trying to provide joy and many amusing moments for each one of you we’re offering Cattle and Crops mods . Within these mods you can provide yourselves many advantages to ease farming supervision. For all the activities you may choose from different CnC mods categories and the best part of downloading CnC modsis no charge. No payments are required so there’s nothing simpler than ease all the farming activities. Just download, install and that’s what it takes to have a perfect leisure time. Don’t miss this opportunity and prepare to maintain best amusing experiences to create a perfect time of your own while playing Cattle and Crops game.